It was in April 2009 that a reassortant virus (a virus originating from a mix of human, bird, and swine gene sources) hit the United States population and later swept all across the globe. This H1N1 type 1 influenza virus outbreak has now managed to render humans as carriers. Vomiting and diarrhea may accompany these symptoms in most cases. Children affected may also experience neurological changes such as seizures or mental health alterations. 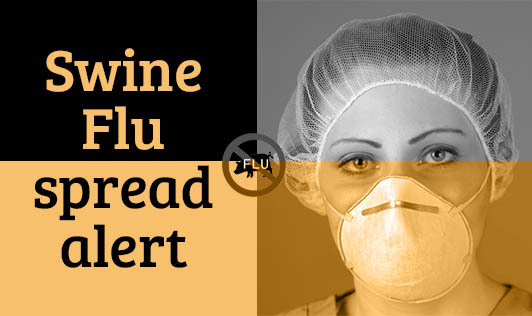 As observed, children, pregnant women, obese individuals and those with respiratory and neurologic disorders are more vulnerable to swine flu. Naturally, immune-compromised patients such as those having cancer or AIDS may also catch this disease easily like most other diseases. Follow personal hygiene - washing hands, using clean cooking utensils, maintaining a separate napkin to wipe your nose and mouth, using a separate drinking water glass, etc. can be simple ways to prevent the spread of the infection. Public health advises such as school closures, travel regulations, isolation if medically prescribed and keeping a good distance from potential crowds are preventive measures that can be taken. Vaccinations do help significantly but may need to be tweaked due to observed genetic drifts. Gargling with warm salt water can help control the symptoms of the flu. Drink enough water to keep yourself hydrated. Eat a well-balanced diet with lots of fruits and vegetables to keep your immunity going. Keep this piece of information on your fingertips to keep the flu at bay.